The capital & largest city is Columbia. State flower is the Yellow Jessamine. Origin of the South Carolina’s Name: In honor of England’s Charles I. Thank you for reminding me, Rebecca. Whenever I add a new author to the site, I TRY to make sure that I add him/her to the appropriate state and theme page. As you can see, sometimes I don’t remember to do just that. So, I ALWAYS appreciate hearing from site readers who “know” their Cozy Mystery authors. I’m currently in Charleston on a vacation trip with my friends and had planned on re-reading the Theodosia Browning Tea Shop mysteries before this trip – but ran out of time. I still plan on re-reading them now that I am actually seeing some of the locations. Judith, I always enjoy reading books that are set in places I know… But, I have to admit that I also enjoy reading books set in places I would love to know, and know I won’t be able to visit any time soon. Hope you’re having a great time in Charleston! Missed this one too. Thanks again for including me. With book two it will no longer be a stand alone either. The Bunco Babes Mystery series by Gail Oust, takes place in Serenity Cove Estates, South Carolina. 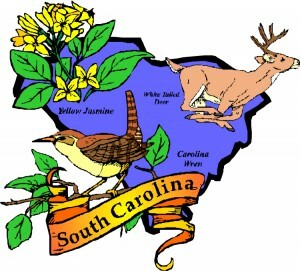 The Callie Parrish Mystery series by Fran Rizer takes place in South Carolina. Thank you, Connie! I don’t know how I overlooked these South Carolina-theme authors. What about Susan M. Boyer and LowCountry Boil?? Marie, thank you for telling us about Bill Noel‘s Folly Beach mysteries set in South Carolina. Help! I’m trying to remember a book which I believe took place in the low country in which the main character is still friend with her ex husband, who happens to be gay. I believe she works in a frame shop or is an interior designer. At one point she restores an old motel on one of the islands.